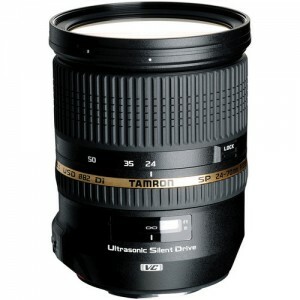 The Tamron SP 24-70mm Di VC USD EF zoom lens is a versatile midrange zoom. The f/2.8 speed matches Canon’s 24-70 zoom, but Tamron has added image stabilization (they call it vibration compensation or VC). The zoom range is very useful, from moderately wide to short telephoto. The EF mount and full-frame coverage mean it works on every Canon DSLR ever, as well as any camera with an EF or EF-S mount. For photo shooters, the Ultrasonic Silent Drive (USD) motor makes for fast and accurate autofocus. Vibration compensation is helpful for stills, and exceptionally helpful for handheld video. The Tamron 24-70mm f/2.8 VC close focuses to 18″ and has 82mm front threads.